The Cypriot parliament has officially approved the bailout deal that the government agreed with its eurozone partners and the IMF. (See here for our previous thoughts on the deal). A rejection of the deal would probably have led to a Cypriot exit from the eurozone. Given such serious consequences it was an incredibly close run vote with 29 in favour versus 27 against (often for such votes politicians shy away from risky decisions). The government is likely to breathe a sigh of relief but it should not view this as the end – it is surely only the end of the beginning at best. As we have noted at length before, the prospects for Cyprus are bleak. Growth is set to crumble over the next few years, while capital controls remain in place, keeping it at the edge of the eurozone (with close to a separate currency since Cypriot euros are clearly no longer worth the same as euros elsewhere). As recently as last Thursday, the controls were extended for 16 days and despite being eased at points, there is no clear plan for how or when they can be removed (strangely the responsibility for the rules seems to have switched from the Central Bank to the Ministry of Finance while the lengths of the extensions have ranged from 3 days to 16 days at random intervals – not effectively a decisive or clear policy approach). Despite the vote being approved it is also clear that politics in Cyprus remains fractured. 29 MPs feel strongly in favour of the bailout programme and the associated actions, while 27 MPs were effectively willing to see Cyprus leave the euro rather than implementing the bailout deal. Meanwhile, the rift between the Central Bank and the government shows little signs of abating. Surely, effective reform and governance will be tough in the future, especially as the anti-austerity feeling amongst the general public rises. The Cypriot government has negotiated a large hurdle but the biggest challenges may yet be to come. Italian PM launches opening salvo against austerity - but where will the cash come from? 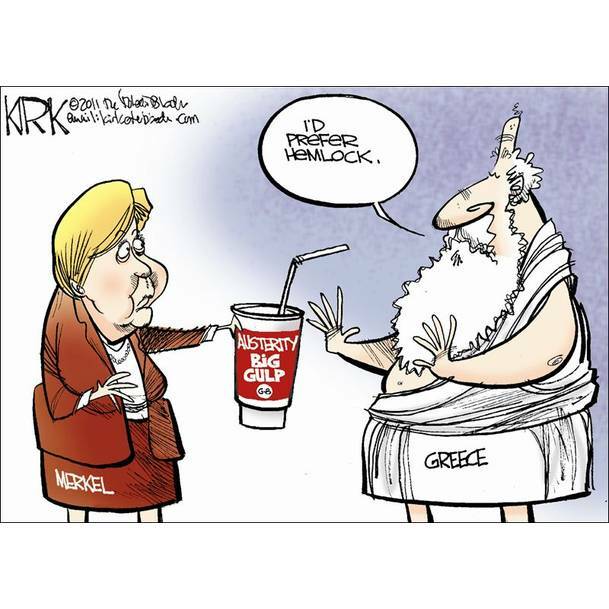 · Some phrases which will make German Chancellor Angela Merkel wince, such as: “We will die of fiscal rigour alone. Growth policies cannot wait any longer”, “[Europe faces] a crisis of legitimacy” and there is a need for a “United States of Europe”. 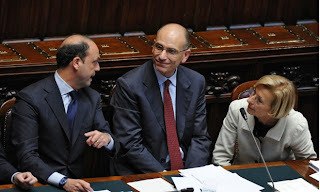 · Letta believes Italy’s welfare system is inadequate and will look to broaden it to provide further help to women, young people and temporary workers. · Businesses will also receive tax incentives to hire young workers. · Again no details on how such policies will be funded. 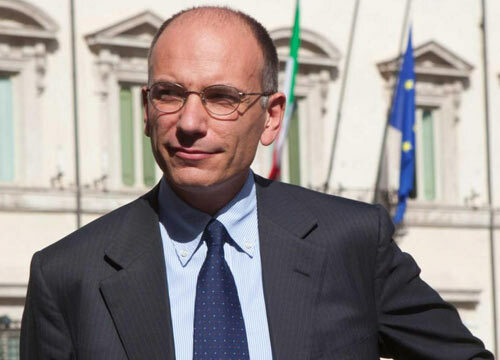 La Stampa reports that all in, the “Letta Agenda” could cost €20bn. He made no mention of privatisations or the sorely needed reforms to the labour and product markets to make Italy more competitive. · Letta did stress that Italy will meet all of its EU commitments and targets. · He set himself and the new government an 18 month window in which to achieve the some success in turning around the economy or “face the consequences”. · Promised to reform the electoral law and cut MP’s pay. A very interesting opening salvo from Letta. In fact, not too dissimilar to French President Francois Hollande’s early comments regarding austerity – we can’t help but wonder if his enthusiasm and/or success will wane in a similar way. One thing that is clear from the speech is the continuing power of Silvio Berlusconi (as we previously noted). La Stampa suggest up to €12bn of the cost of the ‘Letta Agenda’ actually comes from Berlusconi’s demands, while following the speech Angelino Alfano, the new Deputy PM and key Berlusconi ally, said, “I share the words of Enrico Letta’s speech from the first to the last. It is music to our ears.” Meanwhile, Berlusconi also took the opportunity to this morning ramp up his own rhetoric against austerity, calling for the new Italian government to “renegotiate its deficit commitments” with the EU. Writing on his Telegraph blog, Open Europe Director Mats Persson argues that anyone who prays for Germany to U-turn on its eurozone policy after the September election will probably be left sorely disappointed. "Fuelled by an intensified wider debate about the merits or otherwise of austerity as a remedy to economic problems, the last few weeks have seen politicians, commentators and economists coming out in droves to criticise Germany’s austerity-for-cash approach to the eurozone crisis. The new Italian Prime Minister Enrico Letta – who is today meeting his German counterpart, Angela Merkel – said yesterday that Italy “will die of fiscal consolidation alone”, leading some to conclude that Italy will lead the revolt against austerity in the Eurozone. Everyone is now looking ahead to the German election in September, with the idea being that with election season gone and perhaps with a Conservative/Social Democrat "grand coalition" at the helm, Germany will flinch and drop the whole austerity thing. Unlikely. We might see some easing of targets and toned down rhetoric, but no fundamental shift. The German consensus on austerity runs incredibly deep. Although, strictly speaking, in Germany, austerity is actually not called austerity at all (it sounds “evil” as Angela Merkel has pointed out). Instead, the term used is sparkurs (savings course) or sparpolitik (savings politics). Or as a verb; Hausaufgaben machen – to do your homework. The opposite is schuldenpolitik (debt politics) or Schulden machen (to make debt). Such semantics matter. Fundamentally, they illustrate that the perceived dichotomy between ‘austerity’ and ‘growth’ – which strikes a chord with some other electorates in Europe – is a non-starter in Germany. 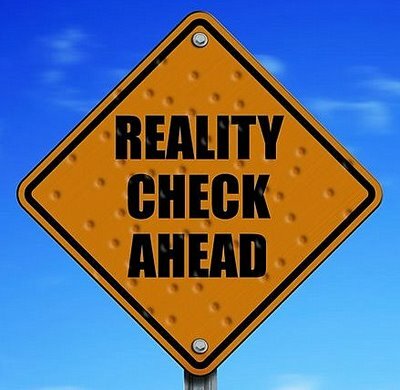 It would be electoral suicide for a German politician to advocate schuldenpolitik – akin to an American Presidential candidate professing himself an atheist or a Swedish politician denying climate change (the latter would most likely also involve being stripped of one’s Swedish passport). This logic drives politicians’ approach both at home and abroad. By and large the main opposition party, the centre-left SPD, does not advocate a radical departure from Merkel’s blueprint. Instead, it merely nit-picks at the edges while garnishing the whole exercise with concerned rhetoric about the social consequences. A typical SPD critique is that expressed by Nils Schmidt, the leader of the Party in Baden-Württemberg: “We have to make cuts, but step-by-step, we can’t make them all at once.” The key there is “we have to make cuts”. And remember, in an effort to be seen as tough on irresponsible banks it was the SPD that was the most hawkish over Cyprus. Even the Green party is keen to be seen as fiscally responsible taking a tough line on paying down public debt. 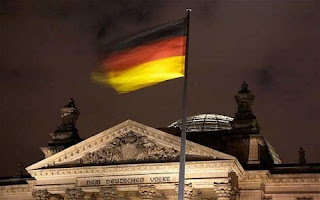 German opinion polls have also consistently backed the austerity-for-cash approach abroad with a recent opinion poll showing that 65 per cent said they agreed with Merkel’s handling of the crisis – up from 46 per cent in July 2011. In other words, even under a grand coalition between Merkel’s CDU/CSU and SPD, the basic course in Germany’s Europe policy will remain fairly steady. 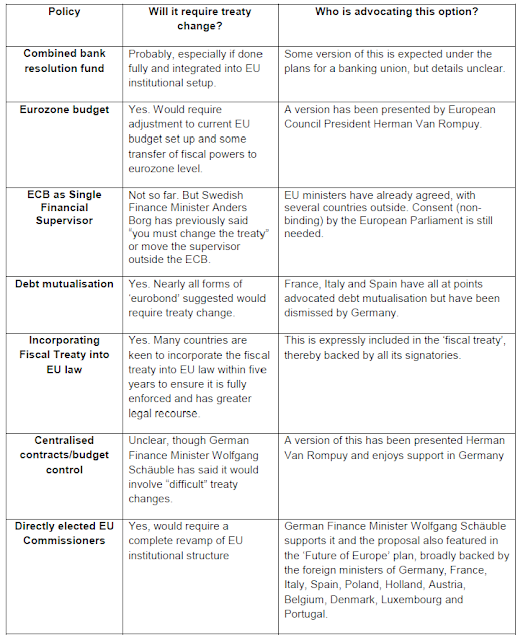 Crucially, the complicated sequencing for any further eurozone integration – such a resolution fund for banks or public debt pooling – will likely stay broadly the same: constitutionally-anchored eurozone-wide supervision first, cash later. 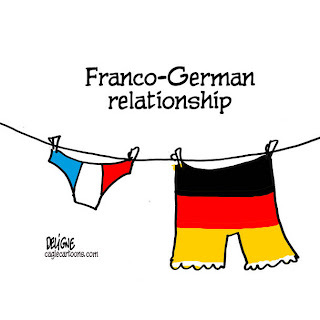 This also means that Franco-German axis will continue to suffer from tensions. There is, of course, an intense debate going on within Germany over the country’s position in Europe – and a worry about being seen as the neighbourhood bully. As I’ve argued previously, the crisis sees Germany’s two post-war pillars clashing head-on – firm commitments to both Europe and sound money. Exactly how this debate will play out remains unclear. However, anyone – say a French socialist – who prays for Germany to U-turn on its eurozone policy after the September election will probably be left sorely disappointed." On Friday Le Monde got a big scoop with the news that French President Hollande’s Socialist party had drafted a strongly worded paper criticising Angela Merkel and her focus on austerity, accusing her amongst other things of “selfish intransigence”. It’s not exactly news that all was not well with the ‘Franco-German motor’ but still pretty explosive stuff and we were keenly anticipating what the German response would be. Likewise the response from politicians was quite muted, with few senior coalition politicians speaking out although the SPD’s former foreign minister Frank-Walter Steinmeier accused Merkel herself of having strained Franco-German relations. So what does this tell us? Well clearly the German media and politicians are unusually introspective and cautious not to stir a nationalistic argument, but that’s hardly news. More interestingly is the degree of relative indifference. This speaks volumes about the changing power balance between the two countries. French President François Hollande's Socialist Party will hold its 'Convention on Europe' in Paris on 16 June. Several working papers are currently being prepared as a basis for discussion among party members and supporters at the Convention. One of them has been leaked to Le Monde. And believe us, it contains some pretty strong stuff. We learn from the official website of the Convention that the papers do not reflect party policy "at this stage". The draft published by Le Monde could still be tweaked before the Convention. "The communitarian project is today wounded by an alliance of circumstance between the Thatcherite rhetoric of the British Prime Minister - who only conceives a devalued à la carte Europe - and the selfish intransigence of Chancellor Merkel - who cares about nothing but the savings of depositors across the Rhine, Berlin's trade balance and her electoral future. In this context, France has today the only genuinely European government among the EU's big member states." "Democratic confrontation with the European right means political confrontation with the German right. 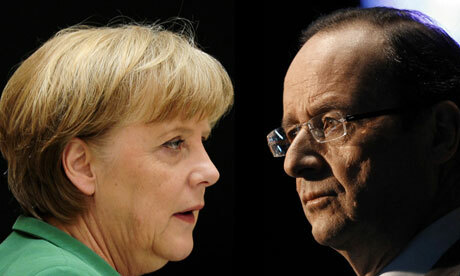 Franco-German friendship is not the friendship between France and Chancellor Merkel's European policy." "[Former French President Nicolas] Sarkozy had imposed a certain practice: not Franco-German friendship, but France's alignment to Germany." The document concludes the party should stand behind President Hollande and support him "in his arm wrestling against the austerity Chancellor [yes, it's Angela again] and the European Conservatives." It's hard to imagine the French government or Hollande himself publicly endorsing this document, but the sense of frustration is palpable and points to the widely recognised relative decline of French influence over both the direction of the 'Franco-German motor' and the EU more widely. It signals the mood within Hollande's party is becoming increasing hostile to Mrs Merkel, and that the party wants the President to be tougher in confronting the German Chancellor. Not a call Hollande can keep ignoring forever. But also a fight, deep down, he knows he is probably not going to win. Beyond the spotlight of high-profile crisis meetings of EU leaders exists a very different community. A group that can almost be likened to a sub-culture. They meet in over-sized buildings in Brussels or at conferences and hotels around Europe. You will almost certainly never have heard of them. These are the EU's committees and quangos. Some useful, some completely irrelevant. Topping this group is the European Economic and Social Committee. If you've never come across it, don't worry - you're in an overwhelming majority and haven't really missed out on anything. The EESC exists in order to act as "a bridge between Europe and organised civil society" by acting as a point of consultation for the EU by bringing together 'representatives of civil society' - 344 from across the whole EU. In practice the majority of these are representatives of trade unions, the third sector and academia, although business people are also represented. There's only one problem: no one actually quite knows that the EESC actually does. In recent memory, we have yet to see evidence of it actually having had a measurable effect on a single piece of EU policy. The areas it is involved with are well covered by national authorities, the Commission and the European Parliament - which for better or worse actually has some powers. It's not that the EESC makes "bad" decisions or is actively harmful. The body - much like its cousin the Committee of the Regions - is simply completely irrelevant in terms of what is happening in the real world. And yet, it has a budget of around €130m a year. "Henri Malosse is keenly aware of the disconnect between Europe and its citizens, a fact again brought home by the Greek and Cyprus crises. Convinced that one of the answers lies in a rebalancing of forces in Brussels, he wants the European Union's second assembly to do more to embody people's real expectations in areas such as job creation, combating youth alienation, protection of savings and access to health care." Makes sense. If only the EESC got a bit more power, than we're sure that the collapsed interbank lending market would be restored over-night. A few more EESC conferences would do wonders to bring down unsustainable debt levels in the eurozone. Meanwhile, hire a few more EESC staff and the 27.2% record unemployment rate in Spain would be immediately reversed. If only the EESC could be given enough cash to embody "real people's expectations", the EU's democratic deficit would practically be closed already. Our point? The EESC is emblematic of the EU's Achilles heel: its incredible difficulty in adapting to changing economic and political circumstances. Everyone knows that the EESC and Committee of the Regions - which together cost taxpayers around €215m - are pointless bodies. They're by-products of a long bygone era, premised on the odd principle that in order for "civil society" and "the regions" to have influence, they need their own dedicated institutions in Brussels. In spite of all of this, they remain in place, partly because they're enshrined in the EU Treaties and it therefore requires unanimity to scrap them. As we pointed out in our dedicated report on EU quangos, several of the EU's 52 agencies suffer from similar flaws. Scrapping 10 of the least useful, and imposing efficiency savings on the rest, would save taxpayers a total of around €668m. Not a huge amount of money in the grand scheme of things, but the symbolic value of Europe's failure to address even the most obvious examples of waste and bureaucratic inertia, speaks volumes. The last few days have seen a shifting of consensus in the ECB rate cuts debate. Recent economic data in the eurozone has been particularly bad, with private sector activity slowing more than expected. However, potentially more importantly, this effect has been seen in Germany and some of the stronger northern countries as well. In response to this data most banks and analysts shifted their expectations and now forecast an ECB rate cut in May or June. The thinking goes that, a slowing economy in these countries (and therefore lower inflation) will give the ECB more scope to cut rates without fear of it having disproportionate effects on the stronger economies. After all, the ECB is meant to find a balance that suits all countries (although it rarely does, hence the flaw of one-size-fits-all monetary policy). As always on central banking issues though, Germany remains the key player. "The ECB is obviously in a difficult position. For Germany it would actually have to raise rates slightly at the moment, but for other countries it would have to do even more for more liquidity to be made available and especially for liquidity to reach corporate financing." "If we want to get back to a bearable interest rate level, then we have to get over this internal division of the euro zone." In a country where central bank independence is worshiped, politicians usually stay well clear of commentating on monetary policy, so Merkel's comments are quite extraordinary. Perhaps they were prompted by increasing noise coming out of the French government over what it sees as the need for the ECB to take a more activist approach, despite a genetlemen's agreement between the two governments not to discuss ECB policy in public. "Monetary policy is not an all-purpose weapon for any kind of economic illness…Due to impaired monetary policy transmission, the pass-through of rate cuts to the periphery would be limited, and this is where they are most needed. and to reduced incentives for governments, banks, and corporates to adjust." For numerous reasons, it seems that a rate cut should not be taken for granted after all. Asmussen is right that given the broken transmission mechanism and market fragmentation, any cut will have limited effect on the economies where it's meant to provide a boost. But more importantly, there is still a view in Germany that lower rates could have a harmful effect particularly by pumping up an asset and property bubble – similar to those seen when newly low ECB rates were introduced in the south during the euro's creation. That said, the wave of voices calling for some ECB action is growing, particularly given the wider debate on austerity. It will be tricky to balance this with the demands of the northern countries. 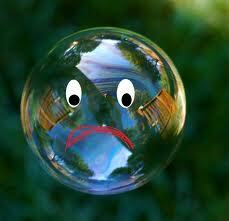 Once again the ECB finds itself stuck as the main player in an increasingly political debate. As was made evident by the internal memo about the EU financial transaction tax (FTT) - that we exclusively published yesterday - there are plenty of concerns amongst the supposed champions of the idea. 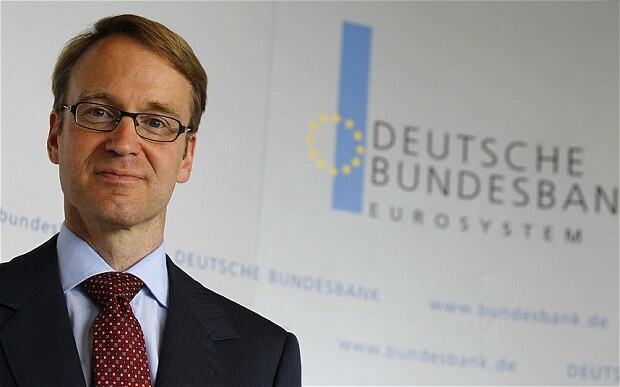 Today, another heavyweight institution raised the alarm: Die Bundesbank. This could come across as a niche issue, as with most central banking issues. 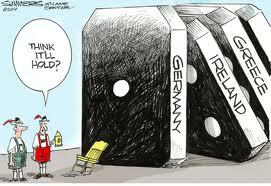 But as with most central banking issues it could also be of vital political importance in Germany. Increasing banks’ reliance on cheap ECB cash: With central bank lending exempt from the FTT but the market channels to obtain liquidity hit hard, the FTT actually provides a perverse incentive for banks to borrow cheap money from the ECB and central banks. This runs completely contrary to efforts in the Eurozone to get banks off ECB liquidity and could instead further entrench market fragmentation. The introduction of the tax has basically been decided but the unintended side effects could be considerable: In its currently envisaged form, the tax will cover asset-backed money market funds, so-called repo firms, and significantly damage the repo market. However, the repo market has a central role in ensuring the equalisation of liquidity between commercial banks. If it does not function correctly, the corresponding institutions are diverted onto the Eurosystem, and the Central Banks remain massively and permanently involved in the liquidity equalisation between the Banks. From a monetary policy perspective, the financial transactions tax in its current form is therefore to be viewed very critically, and it shows how important it is to precisely test a regulatory scheme before its introduction. This however takes a bit of time. Exactly as we warned. More banks - particularly in the southern eurozone - borrowing from the ECB would not only increase German exposure to the crisis (ultimately, the ECB is taxpayer-backed). But it also negatively impacts the independence of ECB monetary policy since it will hamper the central bank's ability to exit its abnormal liquidity operations and therefore impact its ability to control policy. This also gets to the heart of what we (and others) have been saying about the FTT. Although the headline goals and figures look nice, the multitude of side effects (for financial markets, for pensions and even for central banks) mean the real impact of the FTT is far beyond what is envisaged or what can be effectively managed by the regulation. Watch this space. This could become a big issue in Germany. Italy's new Prime Minister: Pro-EU integration, anti-austerity? Letta is from Tuscany and will turn 47 in August. This means he's in line to become Italy's third-youngest Prime Minister ever. He holds a PhD in European Law, and was appointed Europe Minister in 1998. At the time, he was 32 - which made him the youngest Italian minister ever. He also served as Industry Minister under Massimo D'Alema. Letta was an MEP between 2004 and 2006. He's been the deputy leader of the centre-left Democratic Party since 2009. Importantly, he is a big AC Milan fan - which could help him win support from Silvio Berlusconi. Well, perhaps along with the fact that Enrico Letta is the nephew of Gianni Letta, Il Cavaliere's closest aide. So what about his political views and that key austerity point? "firmly committed to changing the direction of EU [economic] policies [which are] too focused on austerity, which as European Commission President [José Manuel] Barroso said the other day are no longer sufficient." "a spur to be prouder, more concrete and effective in our pro-European stance. There's no future without the United States of Europe." This goes to show he is strongly in favour of more EU integration (though admittedly so are a majority of Italian politicians). In other words, Napolitano has appointed a Prime Minister with solid European credentials and who can credibly argue for an easing of austerity in the EU. Quite smart. Crucially, Letta also stressed the new government won't be formed "at any cost". 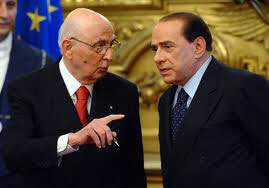 This can be seen as a warning to Silvio Berlusconi not to set out too tough conditions for lending his support. However, it's worth bearing in mind that Berlusconi's centre-right alliance is ahead in all opinion polls - meaning Silvio is in a position of strength right now. Letta will hold talks with all other political parties tomorrow. If things move on smoothly, we should have the list of ministers by the end of the week. Follow us on Twitter @OpenEurope and @LondonerVince for further updates from Italy. Enrico Letta, deputy leader of Italy's centre-left Democratic Party and Pier Luigi Bersani's right hand, is very close to becoming Italy's new Prime Minister. He's currently meeting President Giorgio Napolitano (as you read this blog post), and will be given the mandate to form a new government. Letta is 47, and Amato is 75. So the choice made by 88-year-old Napolitano addresses the Italian electorate's call for a rejuvenation of the political system. This is significant in the 'old vs young' struggle that has characterised Italian politics recently. We will provide more detailed analysis once Letta unveils his list of ministers. In light of his appointment as Prime Minister, we would now expect politicians rather than technocrats to grab ministerial posts - although we can't rule out the involvement of a couple of technocrats in the new cabinet. However, make no mistake: this move doesn't wipe out the deep divisions among the main political parties, and whatever shape the government takes, it won't be easy for Italy to continue with the reforms that the eurozone demands. 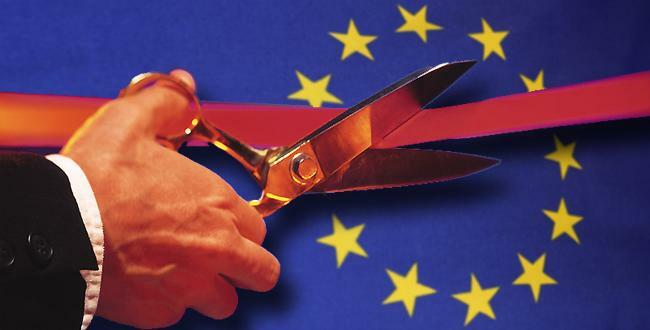 Is the UK winning the argument on EU regulation? Yesterday afternoon Open Europe hosted Business and Energy Minister, Michael Fallon MP, the man responsible for pushing the UK's 'smarter regulation' agenda in Brussels. This is a subject close to Open Europe's heart as we have produced a number of highly detailed reports on the cost of EU regulation - £124bn gross between 1998 and 2010. In his speech, Fallon argued that while the single market had the potential to be the "greatest platform for economic growth", overly burdensome regulation coming from the EU was choking off potential jobs, growth and competitiveness, and as argued by David Cameron in his EU speech, Europe could not afford this in the global context. "The burden of unnecessary costs" was carried more heavily by Europe than by its competitors, he said. He argued that this burden falls particularly hard on SMEs, citing a consultation which found that many had to employ a dedicated member of staff simply to process the workload stemming from the EU's REACH (Registration, Evaluation, Authorisation and Restriction of Chemical substances) Directive. Other areas of EU legislation identified as particularly onerous were the Working Time Directive, the Agency Worker's Directive and other social and environmental rules. During the Q&A session he pointed out that leaving the EU was not a panacea - as UK companies exporting to the EU would still have to comply with many of these regulations without having any say over them, something currently vexing the Norwegians (see here for a more detailed look at this issue). Fallon argued that progress had already been made on over-regulation on both the UK and EU fronts, pointing to strong support from other member states including Germany, which resulted in the recent letter signed by twelve member states calling for a reduction in the overall EU regulatory burden. Fallon pointed out that as a result of the crisis, many member states had become a lot more receptive to UK-style reforms, with France and Poland adopting a 'one in, one out' approach to regulation based on the UK model. He was also hopeful that Mediterranean countries would become allies in this fight given their need to restructure their economies and said he was disappointed they had not done so already. On the UK front, Fallon claimed that the coalition's six-point transposition plan for EU laws had resulted in the elimination of costs associated with gold-plating, i.e. that when adopting new EU laws, the UK would only impose the minimum standards necessary to comply. However, as Fallon acknowledged, there is still more to be done, arguing for example that EU impact assessments ought to be independently verified, and that a "cultural shift" needed to take place in Brussels. The European Commission, of course, doesn't get what the fuss is about, but some countries that are meant to participate in the much-criticised EU financial transaction tax now seem to be going very cold on the idea. Or at least on the way the tax is drafted at the moment. We have got our hands on the memo from the eleven countries that under "enhanced cooperation" have signed up to the tax - reported in yesterday's press summary - which raises a series of concerns about the Commission's draft. Exclusively, we today publish the full six-page memo here. The memo, which in painful EU-jargon is known as a "non-paper", was last week discussed amongst civil servants from EU member states, at a meeting behind behind closed doors. So this isn't reflecting any final position on behalf of the eleven (who disagree amongst themselves on a number of issues). However, this is revealing stuff - it's clear that though several countries are supportive of the FTT in public, they have a whole host of concerns in private. The document is desperately looking for answers on how the Tobin tax would work in practice. This is, of course, in addition to the more fundamental objections to the FTT raised by the UK's ECJ legal challenge, now also supported by Luxembourg, which we have analysed here. 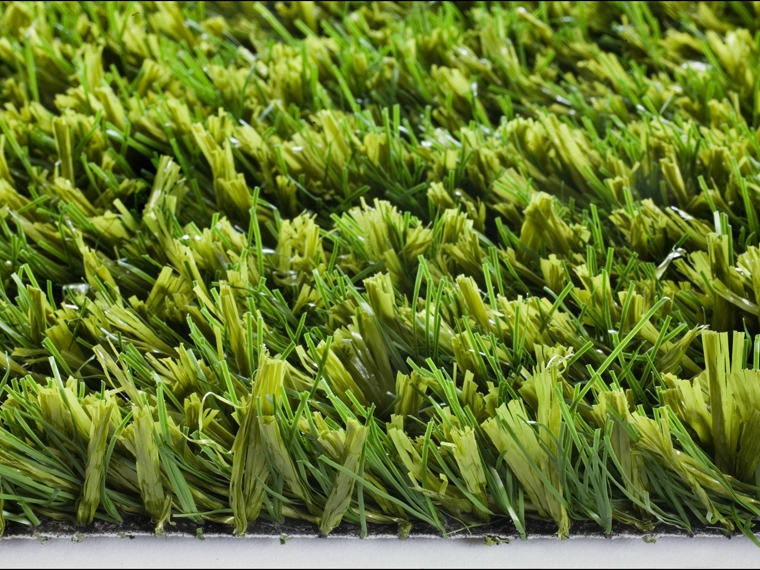 There are calls to clarify how collection of revenues would work in practice. In addition, there are concerns about the impact on repurchase operations on sovereign bonds. "The tax will induce an additional cost that is not sustainable for the market participants,” according to the document. “Repo operations are very useful for managing the treasury liquidity, and the disappearance of this market combined with the lack of viable alternatives will induce serious problems about risk management.” Ever so worried about skyrocketing government borrowing costs, Italy seems particularly worried about this. Given the way ‘territoriality’ works under the Commission proposal in particular, each member state would not be allowed “to collect the whole EU FTT paid on the bonds issued by the same member state. 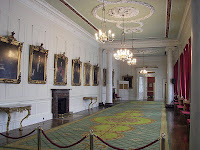 As a result, the increase of cost of government debt…would not necessarily be compensated by the collection of the tax on the same instruments.” This sort of links to UK concerns that the tax would hit a firm based in one country, but be collected by (and therefore the revenue will be enjoyed by) a government in another. Taxation without representation some would say. And the concerns are not only limited to government bonds. The countries note that, “Businesses have expressed worries that the same effect described above for government bonds would replicate on the corporate issuers, with negative effects on the financing capability of companies.” As we've argued repeatedly, this is the risk that the tax will hit business at a time when these are already struggling to balance their books (and are facing particularly high borrowing costs in the south). Uncertainty over the impact of the FTT on high-frequency trading. The member states also ask the Commission to clarify a number of definitions in its proposal (e.g. ‘purchase and sale of a financial instrument’, ‘cancellation or rectification of a financial transaction’, and so forth). In other words, even among its supposed champions, the potential impact and practicality of the FTT are shrouded in uncertainty and a lot of concerns, particularly when it comes to effects on the real economy at a time when the eurozone is desperate looking for growth. For anyone with an ounce of grasp of economics, this internal memo strongly supports the accusation that the FTT has a lot more to do with politics than evidence-based policy. When ideology meets economic reality. "If Great Britain leaves the EU, it would be a great disappointment to us. It would weaken Nato, it would weaken the British influence within Nato. I think from a military point of view the disadvantages for Great Britain would be bigger than the advantages." "I am not talking about economic issues or social issues, or whether you drive on the left or the right side of the road, I am talking about security. I am talking about British influence beyond its own borders. I think it is part of the British tradition that Britain has to play a role in the world. Outside the EU it would not lose a role, but it would reduce their own influence and this cannot be in the interests of Great Britain. We in Germany would lose a strong partner for a pro-Atlantic co-operation with America and a pragmatic British way to deal with security issues." Now, as we've argued in the past, there are a number of drawbacks from the UK leaving the EU - which eurosceptics of that inclination have failed to properly address - including guaranteed market access, voting rights on laws that govern that market access, "pass-porting" for financial services, extra costs at the border for exporting business (rules of origin) and loss of veto to prevent the EU from doing stupid things. Here, German politicians make good points when they talk about the UK's future position in the EU. However, the one area that would be largely unaffected - or even completely unaffected - by a possible UK withdrawal from the EU is defence and Britain's military position.The reason is simple: hard power in Europe is simply guided by logic and incentives untouched by the EU institutions. It's a separate dialogue completely. In other words, Britain would be an absolutely key part of "security Europe" even if it left the EU tomorrow. It wouldn't enjoy either substantial benefits or drawbacks with regards to military cooperation - the EU would be largely irrelevant. Even in the broader field of "foreign policy", the UK would be a key partner. 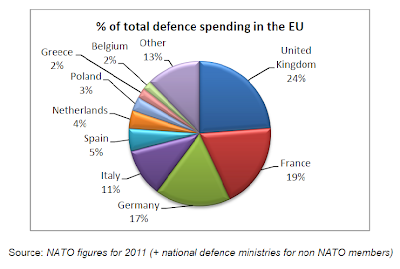 The UK remains one of Europe's 2 1/2 military powers, being the biggest single spender on defence in Europe - spending as much as Italy, Spain, Netherlands and Poland combined. Britain would still have its permanent place on the UN's Security Council and its nuclear deterrent. Meanwhile it is telling that France and the UK have chosen to deepen their defence co-operation outside of the EU. When it comes to hard power the EU institutions become invisible; think the Balkans, and more recently Iraq, Libya, Syria and Mali. The UK may benefit from EU membership in the broad area of foreign policy (for example the recent EU-brokered peace deal between Serbia and Kosovo) but if the UK left the EU tomorrow, it would have no impact on its security capabilities. Conversely, EU partners may find it easier to press ahead with a "European Army" (though not really given political realities). It might be European, but it sure as hell won't be much of an army. Let's pick the right targets when arguing for continued UK EU membership. 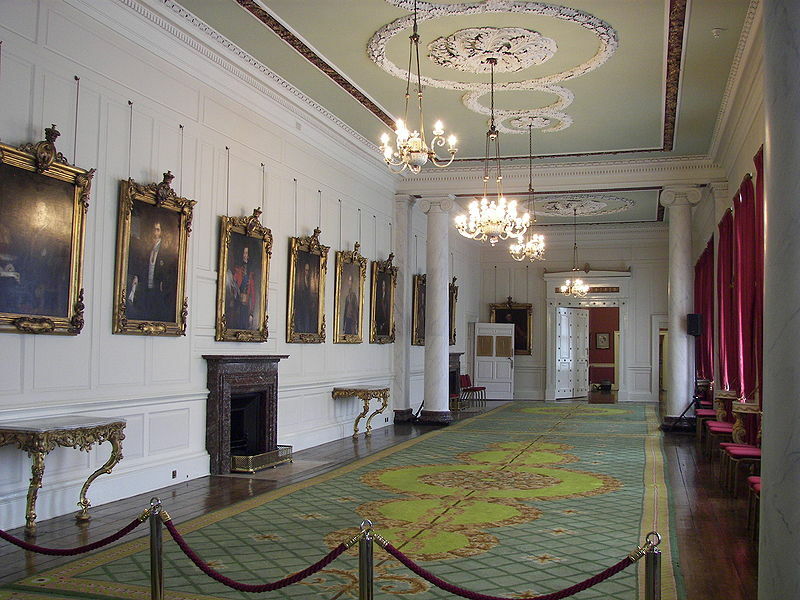 Today, over a two hour working lunch in Dublin Castle's grand State Dining Room, EU Environment Ministers will be discussing the EU's contribution to reducing global CO2 emissions post-2020. 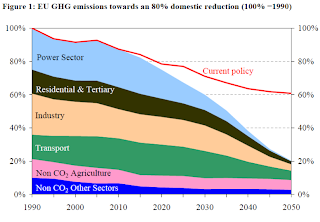 The Commission's Green Paper on the menu is austere stuff - it calls for reductions in EU emissions of up to 80 - 95% by 2050. Firstly, as you can see on the right, as these cuts are calculated over 1990-levels, we're already some way down the road (due to a recession and continued de-industrialisation). 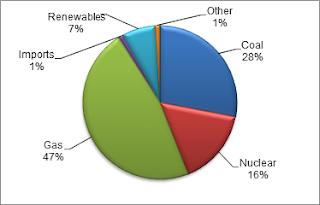 But the majority of the heavy lifting is yet to come. You can also see from this that emissions from some states (Spain for instance) are allowed to go up before 2020. This is due to "burden sharing" allowed under EU rules. If the assembled ministers decide to do that again for 2030 it will mean higher cuts for the UK. EU Green paper: Power generation - 0% CO2? And Italy's new President is...the old one! What happens next? It took the Italian parliament almost three days and six ballots to elect a new President of the Republic. Well, newish. Incumbent Giorgio Napolitano, who will turn 88 in June, eventually caved in to pressure and agreed to serve a second term. This is unprecedented in Italian history and shows how deep the country's political crisis is. Unable to overcome the stalemate and agree on a new President, the main parties have turned to the old one and begged him to stay. The good news is that, following Napolitano's re-election, Italy looks set to have a new government in place sooner rather than later. The big news is the new government would undoubtedly include Silvio Berlusconi's party. Napolitano will take his second oath this afternoon. From that moment, he will re-gain the power to dissolve parliament and call new elections. Crucially, Napolitano has said he will "clarify the terms" under which he agreed to stay on in his (second) inauguration speech. 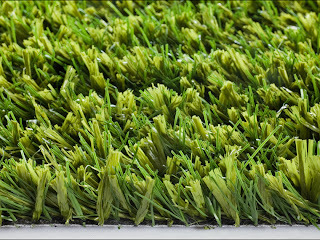 The Italian media are speculating on at least two conditions. First, a shorter mandate than the seven years set out in the Italian Constitution - otherwise Re Giorgio would be leaving office at 95. Second, and most important, the formation of a national unity government - backed by the centre-left Democratic Party, Mario Monti's centrist group and Silvio Berlusconi's People of Freedom party. The markets seem to take the formation of a new government for granted, with Italy's borrowing costs going down this morning. The latest from the Italian media is that Napolitano will hold a swift round of talks and could give someone the mandate to form the new government as early as tomorrow. There are reportedly two clear favourites to lead the new government. One is Giuliano Amato, 75 years old, who already served twice as Italian Prime Minister. 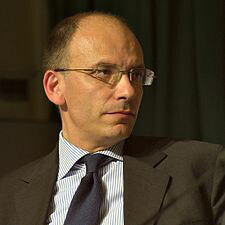 The alternative is Enrico Letta, Pier Luigi Bersani's right hand. We would put our money on Amato, especially since not everyone within Letta's own Democratic Party is enthusiastic about him being appointed as Prime Minister. The new government is likely to be a mix of politicians and technocrats. It will focus its efforts on bringing home 5-6 key reforms, based on the proposals put forward by the ten 'wise men' earlier this month. We expect the new government to give priority to political, rather than economic reform. Top of the agenda will be changing the electoral system, along with reforming a pretty dysfunctional institutional structure where the two houses of parliament have perfectly equal powers. In any case, the new government is unlikely to remain in charge for the entire five-year parliamentary term. Whether you like him or not, Berlusconi's handling of the presidential election was masterful. He avoided 'hostile' candidates being elected (think of former European Commission President Romano Prodi or left-wing Law Professor Stefano Rodotà, Beppe Grillo's man). Any new government will be dependent on his party's support - exactly what Il Cavaliere wanted since the beginning. The centre-left is in disarray, and his centre-right alliance is now ahead in all opinion polls. No surprise Silvio was so radiant when Napolitano's re-election became official on Saturday evening. Beppe Grillo also comes out as a winner, although his victory is likely to become more obvious in the longer term. The Five-Star Movement's presidency candidate Rodotà was a high profile one. Yet, Rodotà was ignored by Bersani's Democratic Party - which never really considered backing him without giving any plausible explanation for doing so. Ideal conditions for Grillo to claim "a clever institutional little coup" was materialising. We would expect a surge in popular support for the Five-Star Movement - though maybe not in the immediate future. With a couple of poor strategic decisions, Bersani has pushed his party to the edge of a break-up and lost his left-wing ally SEL. After kissing goodbye what could be his once in a lifetime opportunity to become Italian Prime Minister, he also had to step down as party leader. And his party looks set to be in government with Berlusconi again - an option Bersani firmly opposed. Bersani burst into tears the moment Napolitano was re-elected. Some of that may just be relief at his ordeal being over. So this is where we are at, but things are moving quickly. Keep following us on Twitter @OpenEurope or @LondonerVince for real time updates from Italy. In a short piece for Open Europe's fortnightly bulletin, Lord Renwick, a key former advisor to Margaret Thatcher, argues that if the Iron Lady held office today, she would seek major EU reform before considering a 'Brixit'. 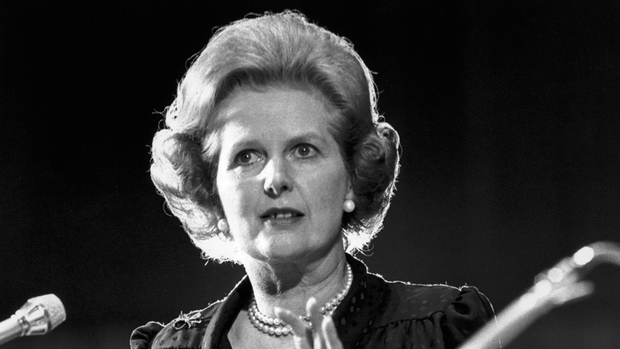 Margaret Thatcher argued relentlessly against the enterprise-stifling effects of EU centralism, hyper-bureaucracy and over-regulation. She foresaw with critical clarity the economic disaster that would overtake the weaker members of the eurozone, unable to remain competitive by devaluing their currencies. She would not accept that the British economy could not thrive outside the EU: that would depend on the policies British governments then pursued. She would and did accept, however, that Britain’s influence would dwindle outside the system, both in Europe and beyond, including with the United States. If reincarnated as prime minister today, it would be uncharacteristic of Mrs Thatcher not to make a huge effort to change the EU, before contemplating abandoning it. She would be certain to seek to launch a crusade with Angela Merkel, the Dutch and Swedish prime ministers and some of the Eastern Europeans to change the direction of EU policy. This would emphasise fostering growth and jobs, restoring competitiveness, and safeguarding the rights of the EU member states outside the eurozone. Only then, would she decide whether enough had been achieved to render continuing membership worthwhile. 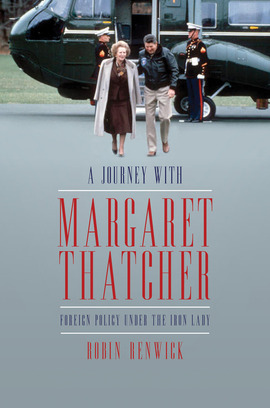 Lord R. Renwick's “A Journey with Margaret Thatcher: Foreign Policy under the Iron Lady”, will be published by Biteback next week. It has just been announced that at midnight last night the UK government submitted a challenge against the financial transaction tax to the European Court of Justice. The ground being that it impacts (taxes) firms and individuals located in the UK outside the FTT zone. We’ve put together a very comprehensive analysis on what this challenge means and what could happen next. Read it here. Summary: The UK has today announced a legal challenge at the European Court of Justice against the EU’s controversial financial transaction tax (FTT). Despite the British Government having chosen not to participate in the measure, UK financial firms that trade with an institution in a country that does participate will still be taxed. This, the UK claims, violates EU law and is inconsistent with international tax norms. The economic, legal and political implications of this move for future EU-UK relations are huge. As currently drafted, the tax could cost fund managers (UCITS) based outside the FTT-zone around €5.6bn while one third of all derivatives trades in the UK could be caught by the tax. Legally, it could set out the parameters for how a “flexible Europe” involving different levels of participation in the EU – which Prime Minister David Cameron has said he champions – will be governed. Politically, it’s a test of the extent to which the UK – as a non-eurozone member - can halt or change EU measures with a profound impact on its national interest. Therefore, it will be a key issue in the on-going debate about the UK’s continued EU membership, though other EU countries have also expressed concerns about the impact of the tax. Is the IMF turning bearish on Spain? It’s been a busy week for the IMF, releasing their latest iterations of the World Economic Outlook, Global Financial Stability Report and the Fiscal Monitor. We’ve been poring over the reports and will continue to do so (see here for some initial thoughts on the WEO). One forecast in particular caught our eye – Spain's. 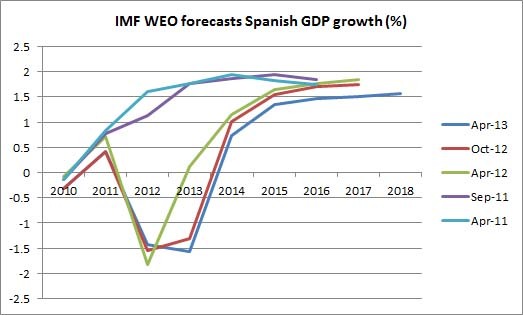 The IMF seems to have turned significantly more pessimistic on the prospect of a Spanish recovery. 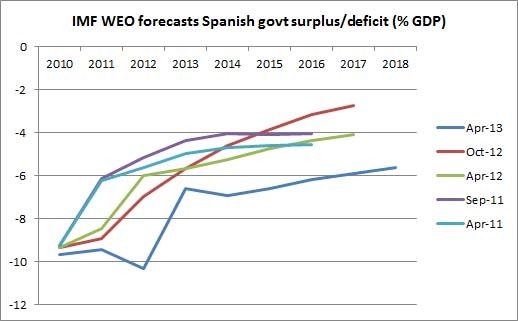 The charts below provide a comparison with the previous WEO forecasts (highlighting how these forecasts tend to be overly optimistic) - which very much confirms what we have noted before about the real risks in Spain. Translation: the government does not have the necessary budget cuts and reforms in place to meet its desired deficit path – step it up Rajoy. Such an increase manifests itself in the debt level projections as well. Worryingly, these no longer peak in 2015/16 and level off thereafter. Instead, Spanish debt to GDP is forecast to reach 111% in 2018 and looks set to keep growing rather than peaking and levelling off. 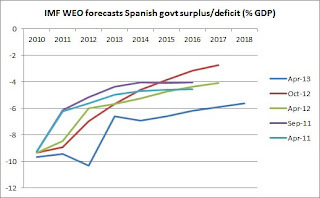 Translation: Spain needs to run large primary surpluses for a long time, but in the face of increasing welfare and pension spending, this will need to come from a series of additional and painful cuts. Christine Lagarde has reportedly suggested that Spain should be allowed to ease its austerity programme. Lagarde argues that, although Spain needs fiscal consolidation, it does not need to be front loaded. Such an argument is not going to sit well with the eurozone and will increase the tensions within the Troika (some of which were outlined in this FT article earlier today). 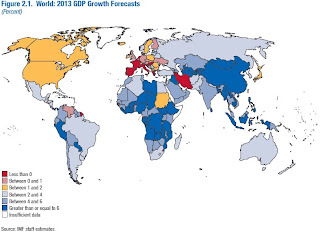 As the graph below shows such an approach may not fit well with the IMF own growth forecasts. 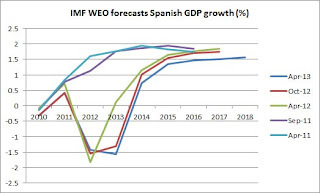 Even with a 7% deficit, growth next year in Spain will be 0.7% according to the IMF. How much more would need to be spent to get to a respectable 1.5% GDP growth? Double the deficit? 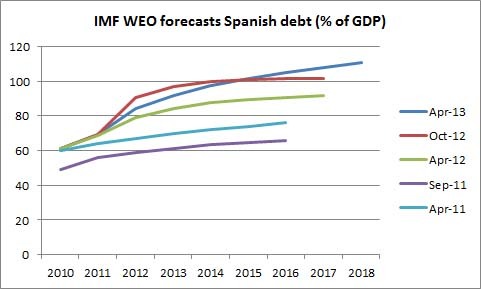 Maybe not something this extreme but with debt already heading towards an unsustainble path it's not clear that there is much scope for further spending, while markets may put pressure back onto Spain once again. This raises the prospect of a further bailout or transfers from other eurozone states, but as we pointed out at length yesterday, Lagarde is talking about something very different than removing austerity in that case. Public support for the EU drops by 16% in one month: is popular support for the euro in Greece finally about to wane? As we've noted in the past, a factor that will determine whether the eurozone can hang together in the long term is the extent to which the public in the South begins to see the euro and EU austerity as synonymous. For example, despite everything that has taken place in Greece, this has not been the case, with a majority of Greeks consistently in favour of remaining inside the euro. The choice is instead perceived as being between austerity or some form of alternative. This is why we rightly predicted that Greece would remain inside the euro following its hectic dual elections last year (at a point when many analysts were predicting an imminent Grexit). But is this now starting to change? A new Public Issue poll shows that 66% of Greeks now have a "negative opinion" about the EU. For a country that has traditionally has been staunchly pro-EU, that's bad enough. 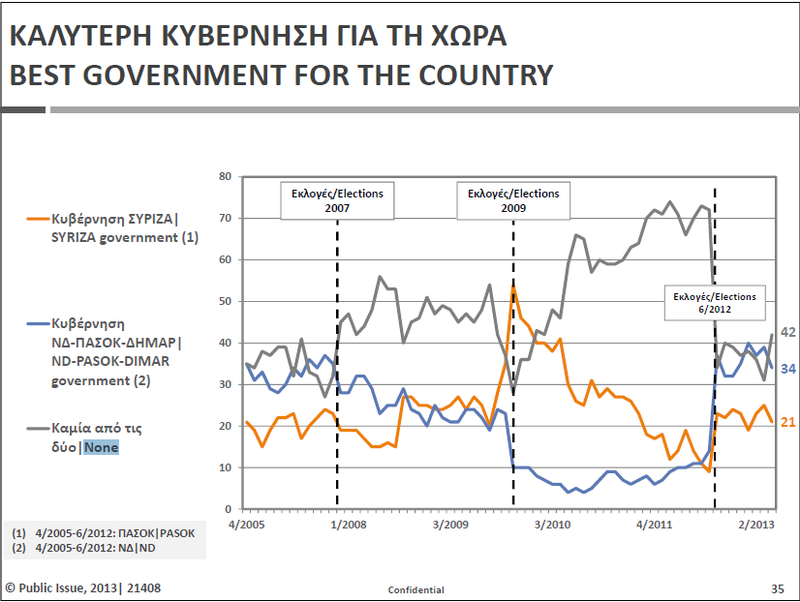 But extraordinarily, when the same question was asked only a month ago, 'only' 50% of respondents said that had a negative opinion about the EU- a massive 16% increase in only a month, possibly owing to the handling of the Cypriot bailout and the renewed Troika push for civil service cuts in Greece. Those with a positive view dropped from 48% to 31% in the same space (see the graph below). A separate poll by Marc for Alpha TV asked the question, “In case it’s not possible to improve the conditions of the loan agreement, what do you think we should do?” 53.8% answered "remain in the EU and the euro", while 41.3% said they wanted to "leave the EU and return to the drachma" (4.9% don't know). Note that this was a question about leaving the EU, not only the eurozone. Whilst still a majority in favour of sticking around, to our knowledge, there has been no Greek opinion poll to date with such a large share in favour of leaving the euro and the EU. 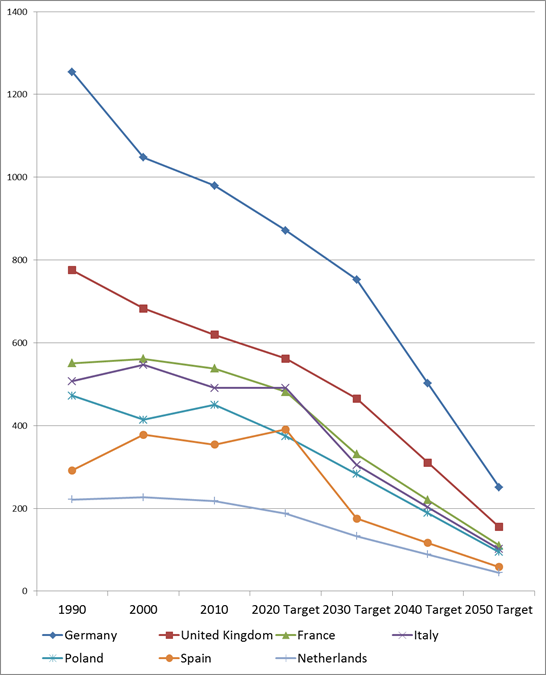 We're not drawing any firm conclusion from this, although if this trend continues it will be significant. Currently a majority of Greeks believe that things "would be worse" outside the euro. It's worth listening to our interview with leading German economist Hans-Werner Sinn, which we published today, on the prospects for Greece in the euro. One thing is clear: this won't be easy. The election of the new Italian President: Has Silvio just scored another one? The Italian parliament starts voting to elect the new President of the Republic today. 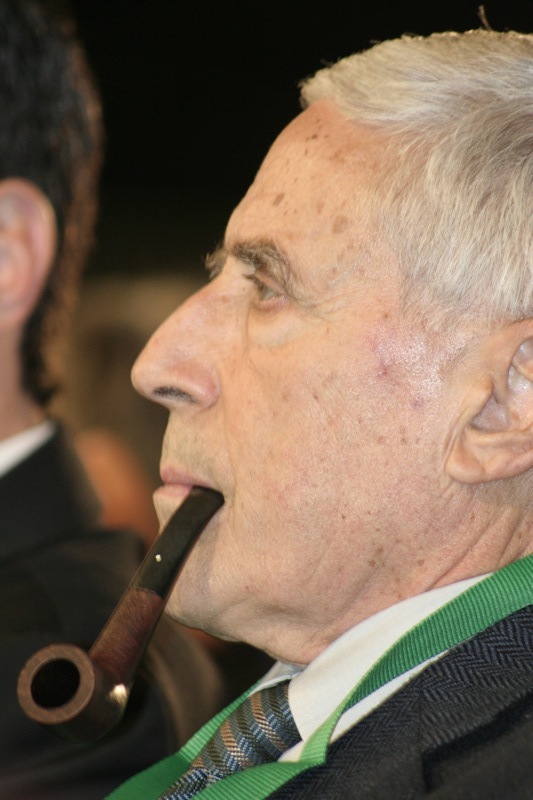 Centre-left leader Pier Luigi Bersani has agreed with Silvio Berlusconi and Mario Monti to back the candidacy of Franco Marini - an 80 years old, pipe-smoking former trade unionist and Senate speaker (see picture). Bersani faced a clear political choice. He could either support the candidate put forward by Beppe Grillo's Five-Star Movement (law professor Stefano Rodotà) or go for a more Silvio-friendly name. The decision to back Marini is a clear sign that Bersani does not want to burn all the bridges with Il Cavaliere - given that talks on the formation of the new Italian government will resume after the election of the new President. The party split over Marini's candidacy. Florence Mayor Matteo Renzi, regarded by many as Bersani's successor as party leader, called Marini "a candidate from the past century". Italian papers estimate that up to 90-100 members of Bersani's party will not vote for Marini. Bersani's left-wing ally Nichi Vendola said Marini's candidacy was "the end of the centre-left". His MPs will vote for Grillo's man instead. Needless to say, all this plays into Berlusconi's hands. His centre-right alliance looks far more united at the moment, and is ahead in opinion polls. If Marini is elected as President and the split in the centre-left remains (admittedly two big ifs), Il Cavaliere could be tempted to push seriously for a return to the polls - this time with a good chance of victory. Finally, a quick reminder of how the voting works. There are 1007 'great electors' (all the 630 MPs + all the 319 Senators + 58 regional delegates). There will be two ballots a day - the first one is currently under way. A two-third majority (672 votes) is required in the first three ballots. A simple majority is sufficient from the fourth ballot on. 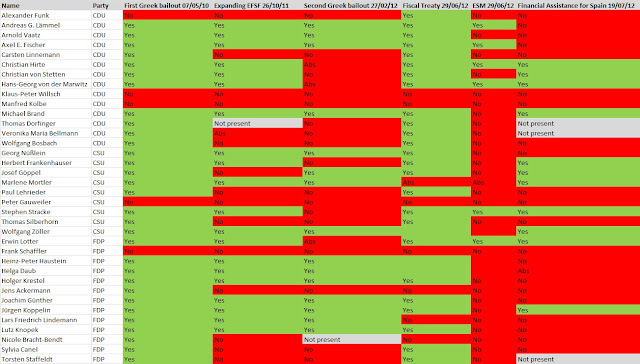 Ballots are secret, so it's hard to predict whether Marini will make it in one of the first three ballots. Expect the vote to be very tight anyway. If Marini fails to achieve the two-thirds majority, Bersani may consider putting forward another name to try and repair some of the damage made to his party. Follow us on Twitter @OpenEurope and @LondonerVince for all the updates on the vote. A mini-storm has been whipped up in the economic community overnight after a paper was published highlighting some flaws in the widely cited Reinhart & Rogoff paper ‘Growth in a time of debt’. A quick recap for those of you not familiar with the paper. It essentially argues that high debt levels are associated with low economic growth. It bases its analysis on data from 44 countries over the past 200 years. It also notes that this relationship gets stronger once debt exceeds 90% of GDP. The paper has been widely cited in defence of and in support for ‘austerity’ – by politicians in both the US and Europe (notably Olli Rehn in respect to the eurozone crisis). The new research released challenged Reinhart & Rogoff’s (R&R) findings, on the basis of an excel error (oops), data omissions and incorrectly weighting of data. There has been plenty written about which side is correct – you can see a summary of criticisms here and R&R’s responses here and here. The question that interests us is not necessarily the intricacies of this academic back and forth. To be honest, it is obvious that there is no clear single threshold above which debt begins to impact growth in all countries and that often specific historical experiences in certain countries may not mean much for policies in different times and places (see this Ed Hugh post for a good summary). This is particularly true given some of the unique constraints of the eurozone crisis. But given that some people are seeing this as a damning indictment of the backing for ‘austerity’, will this have any impact on the approach to the eurozone crisis? R&R research aside it is clear to everyone that Greece, Portugal and Ireland were insolvent, it was market pressure that pushed them into a bailout. Reducing the debt level is a vital part of their reform, while it also serve to counter the significant moral hazard that comes with a bailout. Similar constraints apply in Spain, Italy, Cyprus and Slovenia. With elevated borrowing costs they cannot expand fiscal policy without coming up against greater market pressure and pushing their average interest costs well above their growth rates (especially in the short run). Therefore, arguing for the end of austerity in these countries is actually arguing for fiscal transfers from the rest of the eurozone, since they do not have much, if any, room to expand spending. This is ultimately where the debate is at, it is not about austerity or spending, it is about whether the stronger countries are willing to provide the transfers – be it through banking union or fiscal union – to keep the eurozone together in the longer run and create the architecture necessary so that it can withstand future shocks. If they are not then they have to face the prospect of breaking up or decreasing the size of the eurozone. The constraints which apply also extend much further than just public debt. As we have seen in Spain, Ireland and Cyprus (and are seeing in Slovenia) the levels of private sector and banking sector debt are equally important. The macro picture is much more complex than just the level of public debt and economic growth. The problems in the crisis are a mix of fiscal, banking and structural. Austerity is more than just cutting spending. It has become a catch-all term for some very necessary reforms to improve competitiveness and productivity in the eurozone. Even if spending could be increased, these reforms would be needed, although admittedly the fallout (increased unemployment in many cases and massive political backlash) might be more bearable – but as noted above, this isn’t really possible in many of the worst cases. The logic behind the current approach is also strongly driven by Germany’s own economic experience in the late 1990s and early 2000s, which proved very effective in turning the country around. The main issue here is not whether the approach itself is correct or not (since it clearly did work there), but the scope in which it is applied. It is clear that you cannot have 17 Germanys with economies driven by exports in a single currency bloc where the countries predominantly trade with each other (it might help in the short term but its not clear it is a sustainable long term economic model for the bloc). So what academics (and policymakers) really should debate is whether fiscal transfers are possible and/or desirable. Proving or disproving R&R is neither here nor there when it comes to dealing with the eurozone crisis. Aufstand im Bundestag: Who are Germany's most rebellious MPs? On Thursday, the German Bundestag is expected to vote on the Cypriot bailout. The package is likely to be approved with a clear majority - the opposition SPD and Greens will mostly back it. In addition, the symbolically hugely important "chancellor's majority" - the threshold for the government to get an absolute majority with only the votes of its own MPs - is likely to be reached as well. Only around 12 MPs from the coalition parties (CDU, CSU, FDP) are likely to vote against. This is not particularly surprising. Remember, the bill for this rescue package was largely passed on to Cypriot depositors, and therefore enjoys much greater support in Germany. Still, with the eurozone bailouts remaining ever-so contentious - and with a new anti-euro party on the German political scene - we thought we'd see how many coalition (CDU, CSU and FDP) MPs have so far rebelled on the various eurozone bailout votes. As the table below shows (click to enlarge), according to our calculations, at least 36 MPs have rebelled against Merkel on at least one occasion. Four MPs - Klaus-Pieter Willsch & Manfred Kolbe (CDU), Peter Gauweiler (CSU) and Frank Schäffler (FDP) - have a 100% record in rebelling on eurozone votes - for the rest, there's a surprising spread. 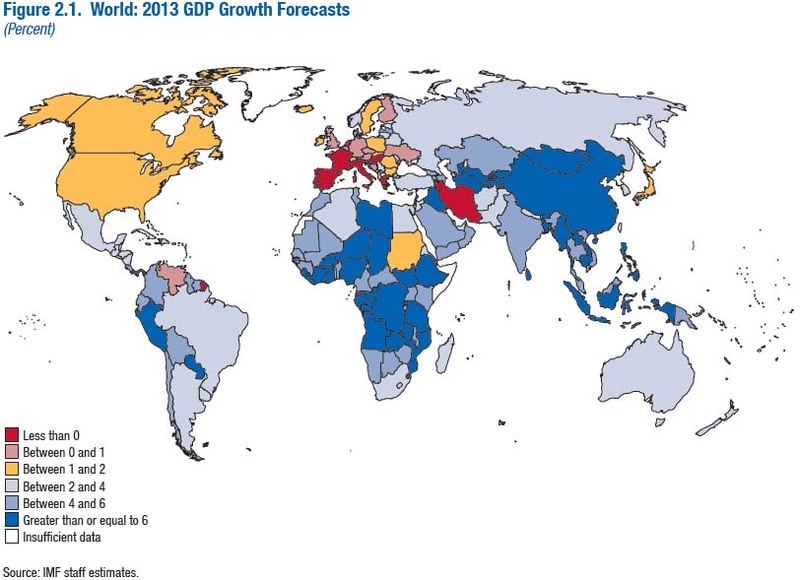 The IMF today released its latest World Economic Outlook forecasts. As usual the forecasts are not overly different from the previous ones - published in October last year - but there are a few interesting points. The map above gives a pretty good feeling for just how bad Europe is doing relative to the rest of the world at the moment (click to enlarge). Amid reduced market pressure and very high unemployment, the near-term risks of incomplete policy implementation at both the national and European levels are significant, while events in Cyprus could lead to more sustained financial market fragmentation. Incomplete implementation could result in a reversal of financial market sentiment. A more medium term risk is a scenario of prolonged stagnation in the euro area. This seems to be clear reference to the banking union and the creation of a cross-border resolution mechanism to deal with banking crisis such as the one seen in Cyprus. This is a valid concern - there is huge uncertainty over the banking union. Current account balances of adjusting economies have improved significantly, and this improvement is expected to continue this year. This increasingly reflects structural improvements, including falling unit labour costs, rising productivity, and trade gains outside the euro area. But cyclical factors also play a role, notably layoffs of less productive workers, and would reverse with eventual economic recovery. Further to that point, there is also the interesting table below showing that Greece, Ireland and Spain have had some success in reducing unit labour costs (change is difference between the dot and the diamond). 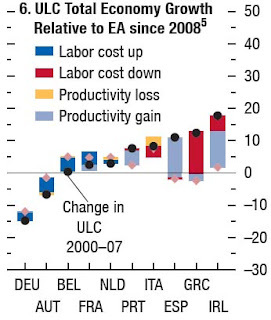 Greece mainly through cutting labour costs but the others also through increasing productivity. But there is some way to go yet, while countries such as France and Italy have made little to no adjustment. It's also worth keeping in mind that, while Portuguese ULCs have fallen from their peak, the trend and some of the fall has now been reveresed. Room is still available for further conventional easing, as inflation is projected to fall below the European Central Bank’s target in the medium term. Greater fiscal integration is needed to help address gaps in Economic and Monetary Union design and mitigate the transmission of country-level shocks across the euro area. Building political support will take time, but the priority should be to ensure a common fiscal backstop for the banking union. We'd have thought, after three years of being exposed to the politics of the troika, the IMF might be a bit more sensitive to the political intracacies of the eurozone crisis. However, it does highlight that the fundamental choice facing the eurozone has not gone anywhere.. Some EU pundits have spent the last several months arguing that a change to the EU treaties is a non-starter. "Don't you know", they say with a high degree of confidence "the Germans have gone off it." And in any case, no one else wants it any way for fear of ratification problems, not least in France. Charles Grant from the Centre for European Reform said last week that "the Germans have cooled on the idea of rewriting the treaties." Another observer on BBC Newsnight (not our guy of course) said as late as last Friday that "the German government isn't at all keen on EU treaty change in the short-term", which the studio discussion then picked up on. "Those who say that Germany has 'gone off the idea' of Treaty change - in light of David Cameron's speech where he mentioned EU treaty change as an avenue for reform - clearly haven't quite appreciated the nature of the proposals floating around." Somehow this announcement still managed to surprise people. But wasn't it always obvious? Anyone who is at all familiar with German history will understand why they're so keen to separate monetary policy from bank supervision. If keeping the two tasks with the ECB, such separation can only take place if there's a rewriting of the EU treaties (so that the final say no longer rests with the ECB Governing Council). This also matters for non-eurozone countries as that guarantees them an equal say in the ECB supervision structure, and therefore makes them more likely to join (particularly Sweden and Denmark, which the Germans are keen on). Indeed, the Swedes - in a very brave moment - tried to push for just such a treaty change but dropped the idea. Further steps, such as a joint resolution fund, will also require treaty changes. There are plenty of hurdles to fresh EU Treaty negotiations - some countries will want to avoid them like the plague - and even if the Germans can get them off the ground, the timing and scope (limited or full? ), remains unclear. It is also still not fully clear whether the eurozone could circumvent the UK via an inter-governmental arrangement if the latter kicks up too much fuss. But what's clear is that, in the land of ordnungspolitk, the idea of an EU treaty change is alive and well. So hör auf mit dem Blödsinn as the Germans would say. Where will Cypriot growth come from? "Why EU mandarins refuse to learn"